Revolution is a topical once-a-month parasiticide for dogs. Provides systemic treatment against a broad spectrum of external and internal parasites and to kill adult fleas and prevent flea eggs from hatching. *Controls American dog tick (Dermacentor variabilis) infestations. Just a spot once a month in front of the shoulder blades is all your pet needs for protection against fleas, heartworm and other parasites. No pills. No sticky sprays. No more hassling with multiple products. Revolution is quick-drying, nongreasy and waterfast, with no unpleasant odor, so you can cuddle and play with your dog as soon as Revolution dries. Studies show that Revolution is effective even if you bathe your dog two hours after applying. Revolution enters the bloodstream through the skin. Concentrations of Revolution in the blood and tissues prevent heartworm disease. 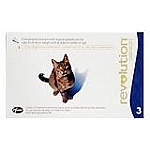 Revolution selectively redistributes from the blood to the skin, where it provides protection against fleas, flea eggs, American dog tick, and mites.